I shall never be bored.. I can not fully pinpoint a time in my life where I was not, to some degree, curious about something. However, I can say that for a chunk of my life my curiosities were quite narrow and specific, where is now I am always looking for more information about a large variety of topics and they are quite the eclectic list of interests. My dramatic change in attitude towards research and staying informed, compared to how I once was as a young teen and young adult, also stems from my many, many, life experiences. These very experiences make me want to know more. I want to know all aspects of a topic rather than simply looking for information to back up my own opinions (not that, that is without merit). I like to be challenged, and love when someone can convince me to change my attitude through constructive, informed, debate. It is this very reason I strive to know more. I want to know the who, why, where, what and how of everything I hear. I believe it is good to be suspicious of everything you read, everything you’re told. It doesn’t mean you do not agree, nor are you disbelieving of what is said, you simple understand that each person’s perspective on what happened can be vastly different to what has actually happened. 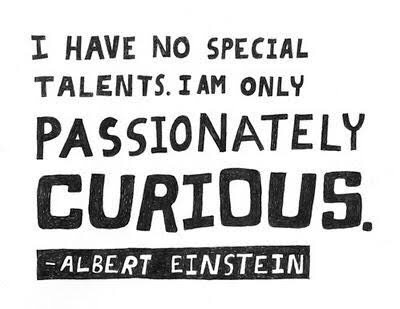 This, is why curiosity is so important. Never lose a curious nature. Always strive to find your own answers and never settle for the opinions of one person/group.